You are here: Home / Another day / Is it summer yet? I’ve been sitting here for the last thirty minutes trying to figure out a way to make my day sound even remotely interesting and I can assure you it isn’t possible. But I’ll tell you about it anyway because when has that ever stopped me? I woke up with a headache. I’m not entirely sure why but I think it was partly due to not drinking enough water the day before and partly because I knew I still had to pack a lunch that had a less than 50% chance of getting eaten. And then Caroline decided it was a good morning to move at the speed of a glacier to get ready. I finally just instructed her to hurry up and go brush her teeth while I went into my closet to change clothes. And by change clothes, I mean that I threw on a pair of running shorts with the t-shirt I’d slept in the night before. After I dropped her off at school in my highly inappropriate running shorts and t-shirt, I came home and made a list of everything I need to get done with my last two days of total freedom. Which is why I immediately got on the couch to watch the season finale of Bethenny Ever After since it falls squarely into the category of things I can’t watch when Caroline is home. I really wanted to watch The Bachelorette too because I have yet to watch an episode, but there just wasn’t time. So I got off the couch and paid a bunch of bills online because P gets so cranky when they shut off our water. And then I tried to book a flight online using a Rapid Rewards voucher which proved to be harder than stopping that computer in War Games from declaring Thermonuclear Global War. I finally called Southwest Airlines customer service and discovered the reason I was having difficulty was due to the fact that the flights I wanted didn’t qualify for Rapid Rewards Vouchers. Who determines that? If you’re going to give me a free ticket as a reward, might I suggest that you allow me to travel on the day and time I actually want to travel? Apparently that’s not a concept that appeals to the airlines. And I’d tell you how it all worked out except it hasn’t all worked out yet. It’s like a cliffhanger. After that exercise in futility, I made a shopping list so I could make my last solo trip to the grocery store for the foreseeable future. Otherwise known as the last trip before it all starts to seem like a version of The Price is Right where contestants bid on items and might win the Showcase Showdown on the right day but might cause their mother to lose her mind in Aisle 7 on the wrong day by overbidding. I loaded up on necessary summer groceries like frozen pizzas and easy things to cook on the days we stay late at the pool which is basically every day until mid-July when the pool feels like bathwater because it’s 164 degrees outside. My other errands were all related to last day of school business. Gift cards, party snacks, and tequila. Then I texted Caroline’s teacher because I needed to run up to the school to have the kids finish something for the teacher gift. I suggested that she go run an errand while I manned the classroom. Have you ever seen twenty children on the second to last day of school? I would have been better off calling the zoo to see if they needed a new monkey trainer. The only difference is most third graders don’t throw poo. As soon as she returned I gave her the biggest hug and maybe said “BLESS YOUR HEART” one too many times and then I mentally made a note to get her an even nicer teacher gift. I left there and went to get my eyebrows waxed since I was already in pain. And to add insult to injury, they did that thing where they ask if I want my lip waxed too. Clearly they don’t watch Price is Right because they overbid in the form of damaging my already fragile self-esteem. And then I picked up Caroline from school where I discovered she hadn’t just let her friends sign her yearbook. She let them sign her face. With Sharpie markers. Yes. And my shorts are inappropriate. Baahaa! Oh my gosh, your last line just killed me. Consequently, I think my child coming home with sharpie all over their face would also kill me. BLESS YOUR HEART! LOL. You said it better than me! Ditto! Just smiles from me! Because we all love you as you articulate the essence of motherhood day in and day out!! Thank you for cracking me up before 7 AM. Laughing out loud!!!!! Be careful. The tattoo is next. Um, maybe the chlorine in the pool will wash the Sharpie off?? I got nuthin’. Aahhh! That is so funny. Happy Summer!! Are you sure you didn’t leave out a detail about the t shirt, such as it was a Team Jacob shirt or possibly Bieber related? I am so dreaded the day when my daughter cares about my attire. Our summer started a week ago and having three kids under 7 home all day is just mean. Mean. I hope you all have a good one! You crack me up! Your daughter sounds a bit like mine. I tried to buy a pair of shorts this weekend, but I made the dreadful (and that’s not exaggerated) mistake of bringing my daughter into the fitting room. I went in at peace with my body and her quirks; I left feeling a little less than human with the ugliest legs in the universe. I did not buy shorts by the way. I guess it’s a good thing or my daughter would slap the “inappropriate” label on me too. My other errands were all related to last day of school business. Gift cards, party snacks, and tequila. It’s not enough that this post is spit-my-Diet-Coke-out funny. But my eyesight fail = I left there and went to get my ELBOWS waxed . . .
My loss of vision is almost as funny as having your elbows waxed. But not nearly as funny as monkeys throwing poo. Wait. That’s not funny at all. Getting more Diet Coke. The only person that I know that can make a post about a day of nothing so completly funny. Loved it very much. Thanks for the smiles. My third grader came home with body parts signed on the last day, but it was just her arm. 😉 her face was taken up by a handlebar mustache, a school logo, and something unidentifiable in the middle of her forehead (that was all face paint, though). I can’t believe you all are still in school-that’s just cruel! Glad you got to go to the store by yourself-that is such a treat! Don’t try to get the Sharpie off with a magic eraser. I’ve heard…from a *friend*…that it leaves a chemical burn! yowzers! spray WD 40 on a cloth and rub the marks with it. Or just let it wear off. We here in Minnesota have always gone back to school after Memorial Day. I worked in school for years and all my children graduated in June. Now they manage to finish before Memorial Day. I have no idea how they do that. They seem to have the same vacation days. Hmmmmm mystery!! TOO funny! This started my day out with a big laugh! rubbing alcohol does wonders on sharpie too : ) good luck! How in the world did Caroline come up with having her classmates sign her face with Sharpie? So funny. Would have loved to have seen your face when you saw hers! Maybe you should give Caroline’s teacher the Tequila. I’m sure she would appreciate it, bless her heart. I.can.not.stop.laughing.about = the running shorts and t-shirt because I have that exact same thing on AND waxing the upper lip. My friends and I talk about this all the time..it makes me self conscious and I find myself looking at my upper lip in the car mirror all the time..because we all know that is the BEST place to notice these things!! The light, the closeness, the fact that anyone can see you! HA! Hope you have a great day! You are too funny! Wait until Caroline starts correcting everything you say with the exact thing you did just say, maybe with only word that is different. Fun times! I was cruising along, just enjoying a nice morning chuckle, UNTIL…”don’t forget to get your pets spayed and neutered”, at which time my latte sprayed all over my Macbook! After wiping it off and praying that the keyboard wouldn’t short out, I resumed reading. ” 164 degrees outside” made swallowing said latte slightly difficult. When I got to “the zoo needing a monkey trainer”, I knew I must STEP AWAY FROM THE LATTE!! You just gave me the best laugh I’ve had all week!!! Thank you. Thank you! And from this Midwest girl, bless your hilarious, inappropriate, tshirt clad heart! You are a DELIGHT! So smart, stocking up on that tequila! Might I recommend taking the additional precaution of stashing small bottles of it around the house? You never know when the urge to do shots, rather than shoot your kid, is going to strike and it might be one of those inconvenient times you’ve locked yourself in the bathroom just to keep from losing your mind. OMG…I love you. Of course, I can laugh because my son’s face isn’t signed with Sharpie. Yet. So funny! 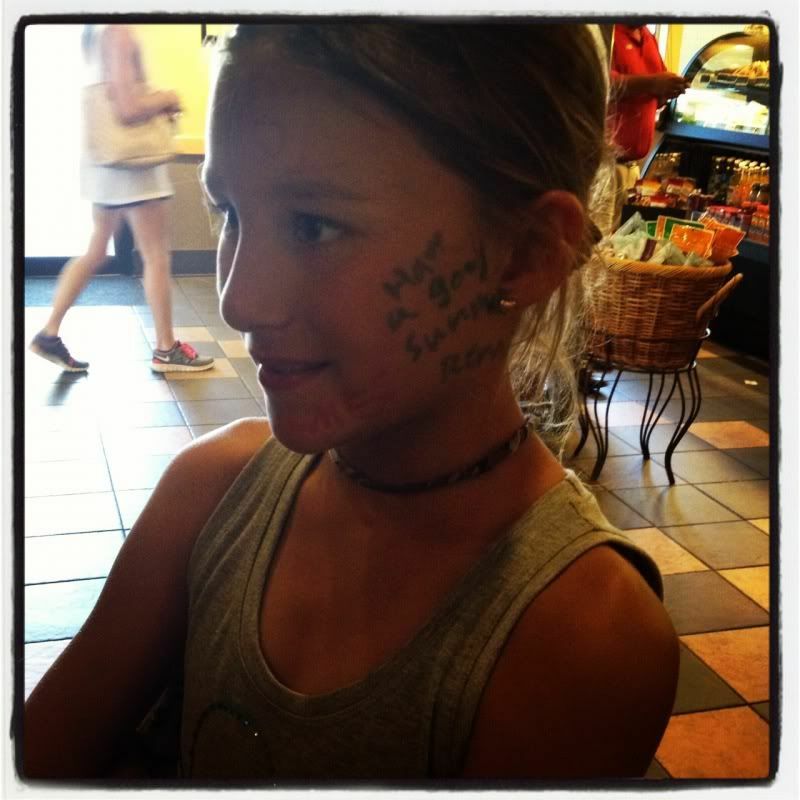 But your daughter is beautiful–writing on her face and all. Grocery shopping with the kids might be the most dreaded part of my summer. Not only do they want everything, if I DO relent & buy it, they refuse to eat it & claim that they don’t like it! Hee hee. That tequila will come in handy! I think Caroline and my daughter Bailey ought to get together–or maybe not. They’re too much alike! Boy, I just hope for Caroline’s sake you changed out of that totally inappropriate outfit before you came and humiliated her in front of her class. Ha! We’re having our children (and us to a point) take a break from ‘media’ this summer, but my daughter just walked up to me and stated in just the right tone of voice, “Mom, THAT’S media.”. Huh, so it is. Thanks for always making me laugh! Ohhhhhh that is an awesome punchline. And you KNOW that’s going to rub off on the one piece of clothing that she owns that she cannot live without EVER. I teach 2nd grade, so I completely understand what the classroom was like…except that I am here to tell you that sometimes, as I have unfortunately discovered this past year, the children DO actually throw poo, at which point I considered changing my career choice to my childhood dream of zookeeper, because at least the animals don’t know any better, right?? All I can say is, this is the first year I have not legitimately been sad to see the school year end and send my young friends to the next grade…. Boy #3 is my last one to finish elementary school and some moms at the end of the year party almost did shots to celebrate. 😉 They are so much more mature at the end of 5th grade. Ahem. Not true.